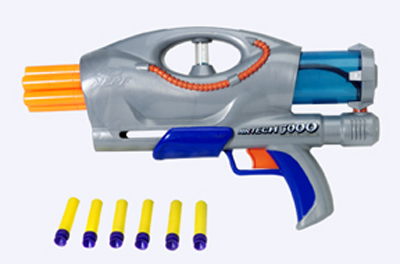 Welcome to my Large Arms page, where all Nerf dart blasters of Superior size are displayed. The most commonly used weapons will be listed at the top, and the more out-of date or non-used weapons will be listed below in a random order. The picture you see here of a crossbow is a rare view. You almost never see these things in their stock form anymore. 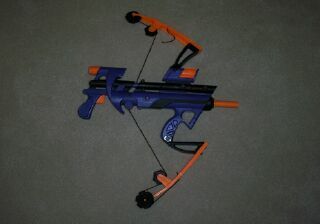 There is only one modded Crossbow I have ever seen that still had the stock barrel up on top, and that is mine. When they are unmoded, they are really not good at all. They cannot make a mega go farther than about halfway down your hall. Well-modified Crossbows are incredible. They are the best plunger weapons out there. They are also the largest plunger weapons out there, but that's why they are so good. Their plunger is extremely long, leaving for a large air capacity in the plunger casing. This allows modified crossbows to achieve extreme ranges for spring weapons. Depending on how well the gun is modified, these ranges can rival or even exceed that of today's modern pump guns. They are extremely accurate, too, and one can learn to hit very precisely with them. The modified crossbow is my personal primary weapon of choice. Mine gets ranges from 90-100'. I have a brass barrel sleeved in Sch. 80 PVC with a breech setup on mine, and it kicks majorly. At Armageddon 2005, I came home with seven headshots to my record. They are absolutely incredible. On to the sad part of the story, they were discontinued in 1995. In other words, they are quite rare, and people are rarely willing to part with them, or if they are, it will cost you somewhere in the ballpark of $50-60 for one. Most people, though they would like something as legendary as a crossbow, still don't really play with the style necessary for a crossbow. 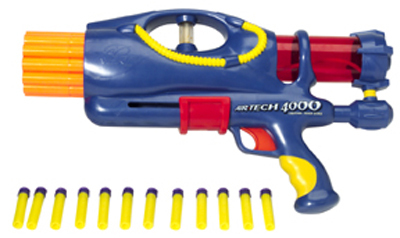 Most people prefer multiple barrels on a gun, such as an Airtech 3000, because they don't have to worry about missing their target as much. Don't feel bad if a Crossbow is not for you, though. Settling for an Airtech 3000 is not at all a bad thing. It is nothing to be ashamed of. If is simply a different style of playing. 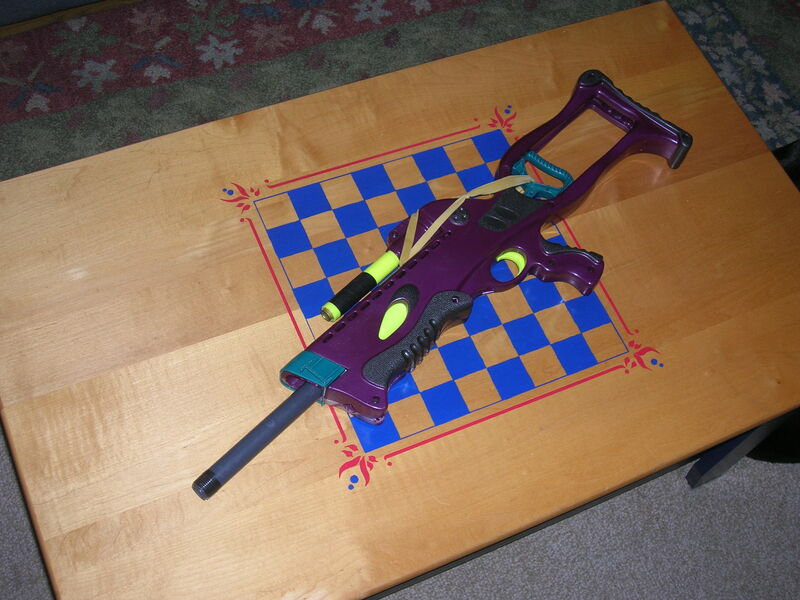 Many consider this to be the best overall Nerf gun ever made. Others debate for the Crossbow. Stil others debate in favor of the Airtech 3000. So the discussion continues, but each has its strengths, and the 1500 is no exception. It has excellent range, and it is easily modified to achieve even greater distances. Though the greatest ranges can be achieved on a 1500 when it has been single-barreled, the best results are when the four barrel turret remains intact, and you replace the stock barrels with better materials, such as Brass or PETG. Even simply putting four crayola markers on the turret and sleeving 1/2" PVC over each of them works wonderfully. Overall, make up your own mind, but Supermaxx 1500's should not be factored out of your thoughts. The Airtech 3000 is the chosen primary of Cxwq, Spoon, and many other legends. It is harder to modify than an Airtech 2000, but not by a whole lot, and they are definetely worth the effort. Ranges of 70' and up are common, and that is often the low end of their range. Six ready-to-fire barrels is one heck of a payload. 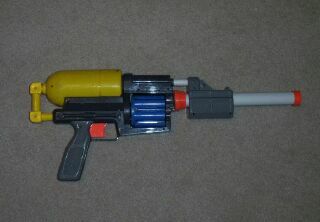 A minnimum of three pumps, without touching anything but the pump, and the next dart is ready, because the turret auto-rotates on the first pump. Excellent weapons, and their size makes them the ultimate standard for assault rifles today. They have recently been rereleased in stores, and are found in twin packs exclusively at Toys 'r Us. The Big Bad Bow (or 3B as many call it), though not as powerful as a crossbow, is still an excellent weapon. Born around the same time as the Lock 'n Load, it is one of the most well-known blasters from the Hypersight line. It is a single-barreled dual-handled assault rife, that is quite lethal. Rumor has it that they are to be rereleased soon, so keep your eyes open. The Powerclip is an excellent weapon for multiple uses. Powerclip rushes are becoming more and more common, and they are quite deadly. The ten-dart streams of foam coming from multiple waving powerclips are very hard, if not impossible, to dodge. Add to that the ability to modify them so that you can remove the clips and shove in another makes their reload times ten times quicker, making them all the more deadly. They get decent ranges as well (for full-autos) in the ballpark of stock Nite Finders, so calling them the perfect raider's weapon is almost an understatement. The wildfire is a good gun, but the Powerclip's ability to have multiple clips makes the 20-round flurry from the Wildfire less efficient overall. Alongside this, Wildfires are prone to breaking. See Wildfire review, but add an awkward, but workable way of exchanging turrets. Still, Powerclips are generally more widely used and liked. 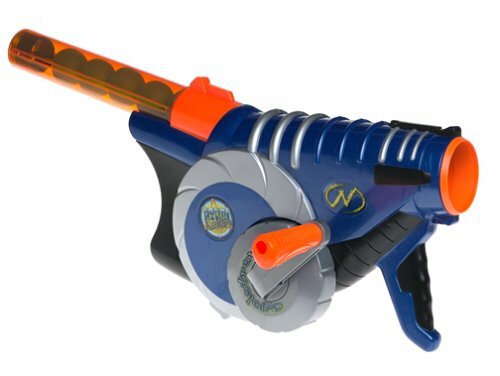 The Titan AS-V.1 is Nerf's Bazooka. It is extremely powerful. However, the stock missiles that come with it don't do its power justice. You have to single barrel it and shoot darts out of it to truly understand its firepower. 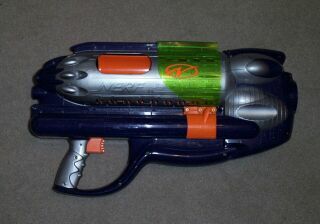 However, like the Supermaxx 5000, this firepower has been banned from most wars. Still, there is enough air output to hook up four or so barrels to the front to fire simultaneously in a shotgun blast-like cloud of darts that is near impossible to dodge. 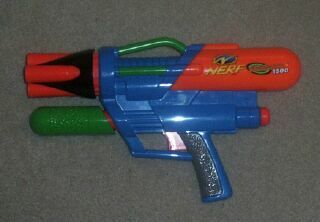 The air hookup on the bottom where the Hornet is intended to connect can be hooked up to an Airtech 2000 valve, and made into quite a powerful secondary barrel, or a quad setup if an Airtech 2000 turret is then installed. 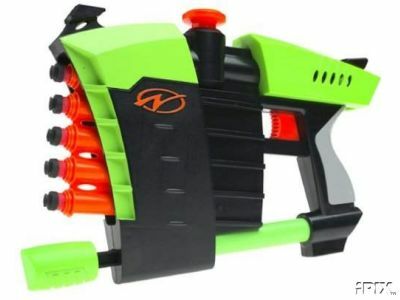 A very versatile gun for its size, the Titan is a great recent addition to the Nerf world. The firefly is a pretty good new gun. In all actuality, it's really just an oversized maverick with two extra barrels. However, it appears to be far more successful in terms of capabilities. You can do a basic modification to it by removing the barrel stems in the same way that you do with a maverick, opening up the turret in the same way. The light-up darts aren't really worth a whole lot, but if you use stock darts, it certinly makes them easier to find in night wars. Stock, they get ranges approaching that of a stock nite finder, and with the pegs removed a fellow clan member of mine's got about 58-60 feet flat. We'll be adding a nested brass setup eventually, which should add some range as well. It's very comfortable to wield, and not too large for what it does (though when you open it up, the entire back half of the gun pretty much is empty and useless, but the comfort of the stock is worth the "wasted" space). The Supermaxx 2500 was conce considered one of the best overall guns out there. However, it has somewhat been removed from the spotlight as new sets have come and gone, while its smaller sibling, the Supermaxx 1500 held on and remained one of the top blasters today. The 2500 Yellow edition is still an excellent blaster, but its bulk has since rendered it less desirable. You should see this coming. 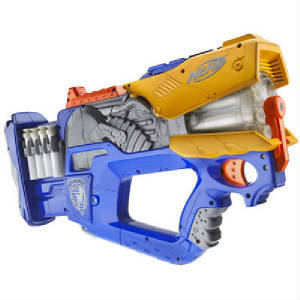 I don't like Nerf's semi-autos. The Blastifire is not exempt from this fule. They are just too much of a pain to mod, and the results aren't really good enough to compete in this day and age. An old, fairly powerful classic. It was once one of the best guns around. If you have one, it may still be of some use. If not, that's okay, because its push-pull system makes others on the market today more accurate than it. The Ballzooka is a Ballgun, so of course I have issues with it. At the same time, though, it has a massive payload of balls, and can put them out at a fairly fast pace. Nevertheless, it has a problem. When you pull out the green handle at the back to then push it in and fire, sometimes the handle will slip out and it is a pain to get it back in. 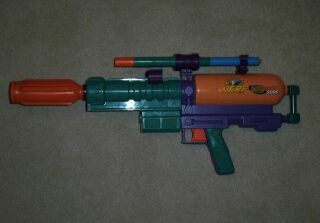 For todays wars, I wouldn't suggest one of these, but awhile back, they packed a punch. 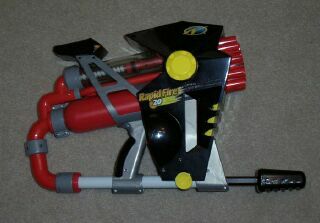 A very loud, more powerful, but very loud newer version of the ballzooka. Without the handle issue, but it is very large and bulky, and it is very loud. Need I say more? The Cyclotron didn't really get a whole lot of attention. Then again, it didn't really deserve a whole lot of attention. It came out quite recently, but it isn't all that great. you turn the crank, and it will click; one click will tighten the internal spring, and the next will throw a ball. About fifteen feet. But that's okay. It's just a ballgun. The Supermaxx 1000 is like an oversised revolver. It does not see use very often, and really is overshadowed by its brother, the Supermaxx 1500. These are more rare than the 1500's, but are still not all that bad. Though it appears identical (save the color change) to the yellow edition, it (for some reason we cannot explain) has a severe lack of power in comparison. 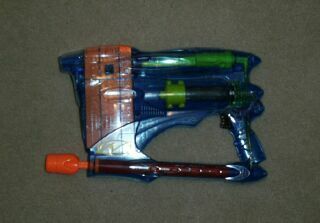 It is not the same blaster, so if you find one, do not think it is the excellent eight-shot rotator you've read about. A slight improvement over the green edition, the Supermaxx 3000 blue edition is still a far cry from the performance of the yellow edition. It's large and bizarre four-finger trigger is easy to use, but the gun does not perform as well as it should. 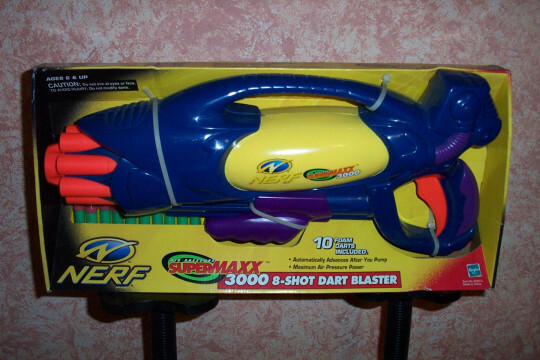 Another classic from the Supermaxx line, this infamous blaster is known for being banned from wars. Single barreled versions of these things are famous for killing squirrels, your opponents, and small children. Slight exaggeration. 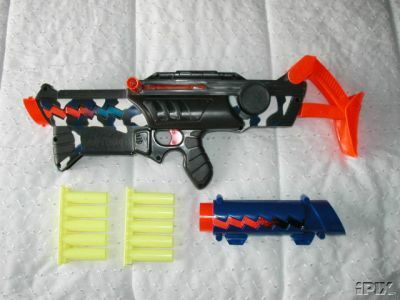 The Supermaxx 5000 was intended to shoot multiple ammunition types, from darts to arrows, to balls. But most people just have it shooting darts. And they hurt like there's no tomorrow. Because of its consistent banning from wars, I wouldn't suggest actively seeking for one. You won't be able to use it much. If you want something to shoot micros really far still, just get a titan. They are still on shelves. It is a ballgun. Accuracy is nonexistent, and its rate of fire is good, but the balls have no range to be of any use. Again, a typical story of old being pushed aside to make way for the better and the new. 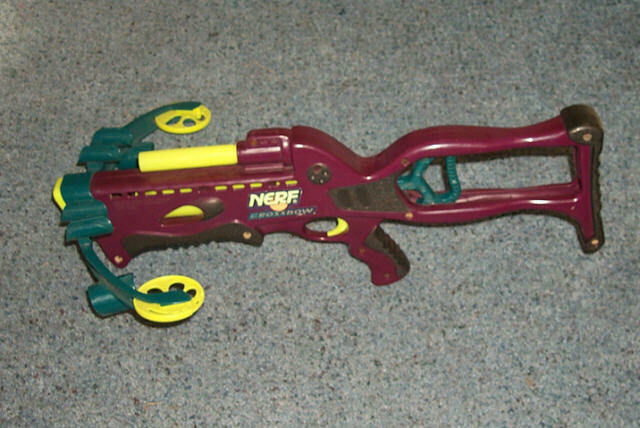 The Sawtooth was Nerf's first attempt at a clip gun, and it failed miserably. Even back in its day, it had poor ranges. There's just nothing we could do to really make it better.